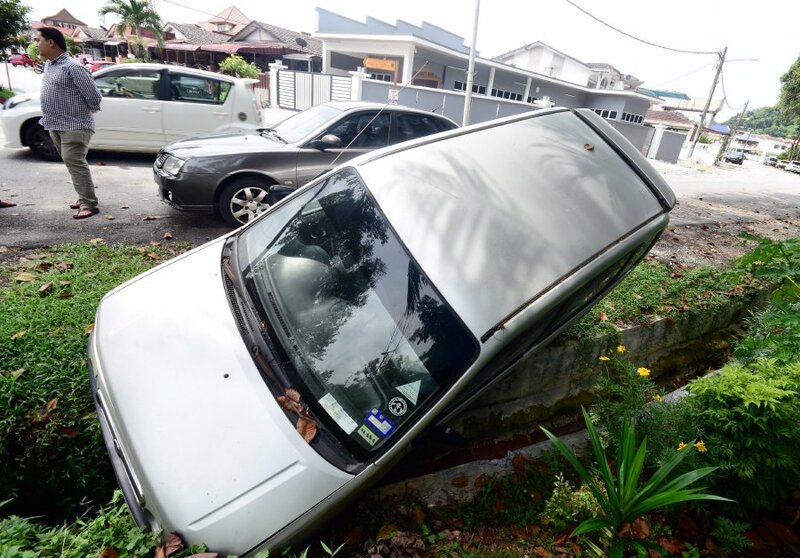 KLANG: It began when a Perodua Myvi skidded and hit a parked Perodua Kenari at Taman Sri Andalas here at 9.45pm on Sunday. A commotion ensued when nearby residents emerged from their homes to determine what had happened. Fearing retaliation over the accident, a couple in the Myvi contacted their friends via their mobile phones for help. Moments later, 15 friends of the couple turned up at the location, and a quarrel ensued between the group and several residents. The confrontation escalated into an all-out brawl and several residents sustained injuries. The scuffle ended abruptly when a 49-year-old resident, who is also a policeman, fired a gunshot into the air in a bid to stop the fighting. The 15 friends scattered and fled the scene in various cars. However, one of them, in his haste to leave the scene, hit a woman resident with his car. He drove away in a panic. “The woman was injured at the waist and several other parts of the body when she was rammed by the car driven by the suspect in his bid to escape,” Klang Selatan District Police chief, ACP Shamsul Amar Ramli told reporters here yesterday. However, police managed to track the suspect, who was detained at Bandar Bukit Tinggi yesterday. The man, in his 20s, was detained by the road side at 1.30pm. An amazing blog you have. I like your theme and might even use it for best essay writing services top 10 essay writers as it will look great. Thanks for the good work. Writer has made a stunning article. You influenced you to show up and no trade roughly. no inquiry this exact certainty that you can not strife with the fact of the matter isn't gigantic, everything has its key case. Do My Homework For Me Online A dedication of thankfulness is all in all for this insights. If you had read Act 1 scene 1, you would have known that it begins with a gigantic battle between the households of Capulet and Montague in the streets of Verona, with almost every male from servant to master. It is the 16th century equivalent of a bank clearing brawl during a baseball or hockey game. This battle is finally broken up by the prince, who promises to carry out the next Capulet or Custom Essay Writing Service Montague, which disturbs the peace again through violence. Starbucks eGift card is a digital card with 16 digit number and 8 digit security code. We can use it in the place of cash. We can use the loaded card at any Starbucks store. Loading the money in the eGift card is also easy. You can load starbucks gift card balance card online using the Credit card or debit card from your registered account.And also at the stores by just swiping at the counter and paying in cash, credit card or debit card. I would like to thank for the efforts you have $1 web hosting made in addressing this post. I am expecting the same best work from you in the future as well. I wanted to thank you for this websites. Very Interesting,your picture made a huge impact on my thinking.brown distressed jacket As you mentioned that good sewing skills makes a huge difference,I never think about that before.keep it up,you are doing great.. I think this is a useful post and it is imperative and scholarly. Thusly, I new social bookmarking sites list need to thank you for the endeavors you have made recorded as a printed duplicate this article.